Tax Code – The code for this tax that can now be added as the default to customers for invoices and AR and to vendors for purchase orders and AP. Description – Description of the tax. Short Name – Name that shows on sales orders, purchase orders, AR and AP. Rate – The percentage rate to charge for this tax. Use Partial Tax Rate – Set if this tax can be charged partially for some items. Partial Rate – The percentage to charge if set to a partial rate. GL Account – The GL account to post this tax to. GL Credit Account – Add a GL account if this tax will be used for input tax credits. Usually for countries that have Value Added Tax (VAT) or GST/HST in Canada,where the tax paid by companies is recoverable against the tax that is collected from customers. Apply to freight – Is this tax to be charged on freight. Apply to surcharge – Is this tax to be applied to sales invoice surcharges as setup in Company Settings/Sales Orders/Surcharges. 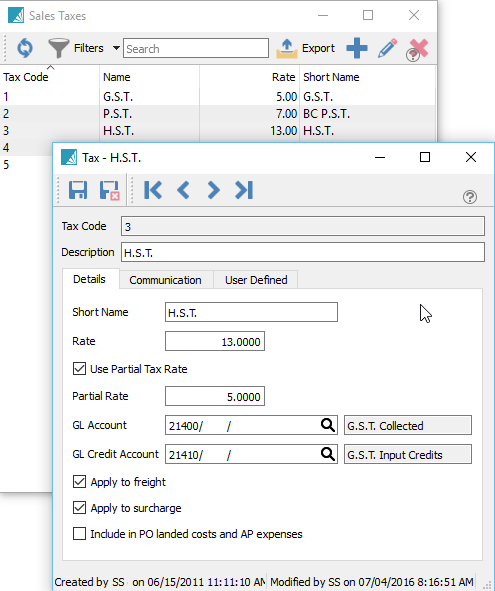 Communication – Add any number of notes related to this tax. Include in Inventory landed cost – When this is checked and the tax is on a purchase order, this tax will be added to the cost of the items on the PO. If un-checked then the tax will be posted separately into the GL account selected as “GL Credit Account”. When the tax is recoverable like VAT or HST this is setting is un-checked.